Vizsla Dog gets rid of Skin Problems? You better believe it! Here at NZYMES® we help people find natural solutions to dog skin problems every day! 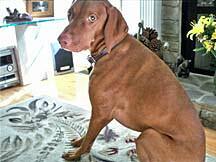 If you own a Vizsla, we put this testimonial up just for you! Take a look at what J. Hicks, from GA has to say about his dog’s journey to recovery. 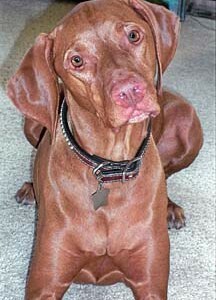 I am so thankful to have found NZYMES.COM website after facing the third year in a row of my Vizsla’s, Scout, skin problems. He would start having hives and hair-loss in the late summer, early fall so we thought it was an outdoor seasonal problem. The vet’s treatment was to give him prednisone and antibiotics. By the third year, this past season, Scout’s issues started earlier and were more severe than before. However, I did not want to put him on prednisone anymore. I knew this was not the solution and ultimately weakening his immune system more. Finding the NZYMES® site and reading what was there only confirmed my feelings and also has taught me more about how to help my dog than anything else. This has been the answer to all Scout’s problems. I started him on NZYMES® Sprouted Granules in mid-November, changed his diet to a grain-free* holistic dog food and added omega supplement. Scout loves his new food and in just this short time (3 months), his coat is a thick healthy mahogany red Vizsla coat with very little shedding. It is so good to see him healthy, shiny and full of positive energy. He’s the best! 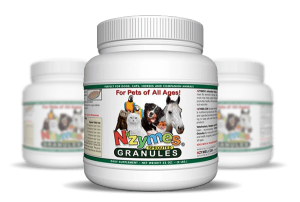 Thank you NZYMES®, I am sure your product has lengthened my pup’s life to a long, full and healthy life.